Spot advertising is the most commonly used form of paid-for-advertising on Commercial Radio. Spot airtime can be bought across different day parts and days of the week depending on the objectives of your campaign. There are really two ways of considering campaign weight planning: weekly reach and weekly frequency. The richest data we have about radio campaign planning is from the ROI Multiplier which shows that generating maximum WEEKLY REACH is the best way to optimise radio ROI. 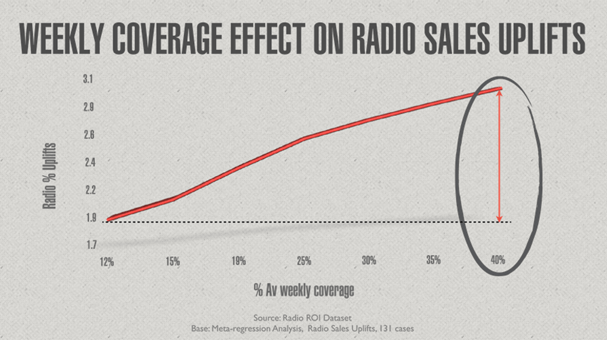 In this study when weekly reach data was modelled against sales uplifts from radio, the results demonstrated significantly improved returns at the higher coverage levels and support optimising weekly coverage beyond the 40% limit of the dataset. It challenges the way that agencies have traditionally planned radio as “the frequency medium”, and suggests that generating maximum weekly reach for a radio plan is the best way to attain optimum radio effectiveness. So this would suggest to plan as many stations as reasonably possible and max out on reach in each week of the campaign on each station (ideally aim for 40%+ weekly reach across the campaign) to achieve the best returns. The way that radio campaigns build reach mean that you naturally accrue higher weekly frequency when maximising reach. On the other hand, if you’re looking for guidance about weekly frequency then the learning is based less on data and more on historical practice. It is generally-accepted common practice amongst agencies, when planning an average weight campaign, to do so at 4 OTH a week over a period of 4-5 weeks. Lighter weight campaigns will be at 2-3 OTH (often used for maintenance or drip campaigns within mixed media schedules). A heavy weight campaign would be 6 OTH+ and often used for product or campaign launches. See Appendix below for further thoughts on frequency planning. Most recent advertising industry research (e.g. the IPA’s ‘The Long and the Short of It’ by Les Binet and Peter Field; ‘How Brands Grow’ by Byron Sharp) highlights the fundamental importance of reach for campaign success. This makes sense – if you plan the perfect weekly frequency but only a small proportion of the population are exposed to this then the campaign effects will be limited. High reach gives the campaign the optimum chance of wider success. In this context, it makes sense to prioritise weekly reach over frequency unless there are very specific tactical reasons to do otherwise. What is the optimum spot length? Whilst the most common spot lengths are 30 and 40 seconds, spots can in effect be any time length of 10 second increments up to 60 seconds or even longer. Research suggests that longer time lengths are more effective at generating recall but, because longer commercials cost more, they do so less efficiently than shorter time lengths. Ultimately this boils down to the creative approach i.e. how long does the ad need to be to get the message across effectively. It can be helpful to include a recommended time length in a creative brief, if only to help manage budgets from both a media and budget perspective, but it’s worth being open to deviating from this for the right creative idea. The standard campaign length for most individual campaigns is around four weeks. However, what is right for your campaign will depend on the objectives. Is this about maintaining a constant level of awareness for an existing brand? In which case consider running over as long a period of time as budget will allow. Or is it about achieving maximum awareness as quickly as possible for a new brand launch or tactical offer? In which case, consider a shorter heavier burst of activity. Bear in mind it takes time for a new campaign to become established so we would recommend a minimum of four or five weeks to ensure cut-through. In general people seek to use stations that reach a high percentage of their chosen target audience as efficiently as possible. Traditional means of measuring station performance (weekly reach, average hours listened by the target) give some indication of what coverage might be achieved, but little indication of the efficiency. The lower the factor, the more cost-efficient the station. Another important factor for many advertisers is selecting stations that focus on specific locations. With a range of national, regional and local stations covering most parts of the UK, radio is highly flexible geographically – providing opportunities for all types of advertisers to precisely target important locations efficiently. J-ET is commercial radio’s ground-breaking electronic trading system which enables agencies to plan and buy spot campaigns electronically as well as track actual campaign delivery. The majority of major media planning and buying agencies now subscribe to J-ET. Campaign objectives e.g. brand launch versus brand maintenance. Is this a slow-burn message designed to remind consumers a couple of times a week over a longer period in order to keep the brand top of mind? How much noise do you need to generate for the brand? Radio’s role within the media mix – is radio the lead medium or support to other media? Clutter – is there a lot of other noise within the category which the ad needs to cut through? If so you may need to make sure you run the campaign at a greater weight to get it noticed. Message complexity – creativity plays an important part in this as well as the complexity of the message. This will vary massively from ad to ad. Ultimately ask yourself how many times do consumers need to hear this particular message to understand it? Do you need to consider kick-starting the campaign at slightly higher weights initially to get the idea established? Wear-out – how many times can listeners hear the ad before switching off (NB this is probably less about the frequency strategy, more about varying the creative copy).